Learn how you can leverage the new portal facilities to build completely customizable Web applications. ...but RSVP if you will be a first-time participant to ensure seating. The .NET User Group of Guam focuses on deploying, developing, and discovering new, innovative, and intelligent ways to develop business solutions with Microsoft's .NET Framework. Meetings are discussions and entertaining technical presentations for enterprise-level architects and developers towards the development of using .NET to develop third-generation Internet and Web applications. Particular attention is given to the development of XML Web services using for local businesses, and integration of .NET applications with many of the platforms in use today by Guam organizations. 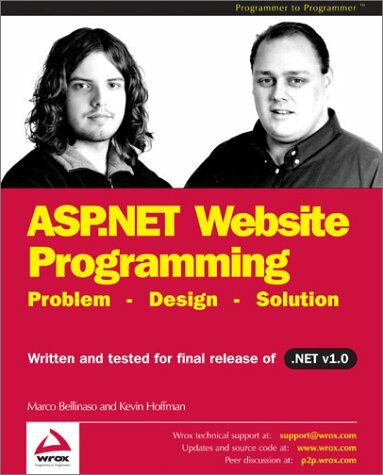 The book contains one of the better discussions of how the .NET Framework handles XML serialization, and integrating system-to-system communications. It also spends a good deal of time deconstructing SOAP. The approach to designing the app is very intuitive – from promoting code reuse, object inheritance, modular component design in XML files, intelligent administration files, and much more. The end result is a big app that performs great and is largely self-sustaining. Using XML Web services, a commerce server/outsourcing vendor provides new services to its customers. Use these books to address your deployment concerns as you move into the next phase of doing business with .NET. With so little (if any) true e-commerce applications being in use now by Guam companies, this is the time to really capitalize on taking our collective game to the next level. Guam's leading online source for news, information, and entertainment has implemented IT solutions to streamline its operations and service its viewers by using next-generation Web technology. Learn about how to implement a simple password-protection schema using ASP 3.0 and VBScript to keep your precious online resources secure and away from would-be snoopers. A payment processing firm uses .NET and the Web services programming model to improve connecting to its platforms. A program for underprivileged schools trades in the file cabinet for the file system, with dramatic results. Which emerging technology/feature of ASP.NET interests you the most? Want to know the latest news, events, announcements, and reports on .NET? Join our mailing list today and never miss a beat.